Green color is related to a person’s Heart Chakra. 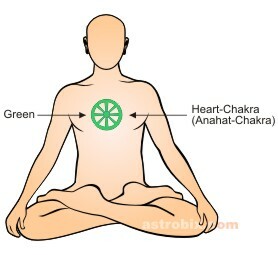 Organs linked to this chakra include heart and chest. It is related to thymus gland. The chakra is concerned with unconditional love. The important quality of this color or chakra is loving yourself. But, there is no greed in that love. When this color or chakra is balanced in an individual then, he has the ability to love. And, by loving others, an individual gets energy. The person loves and likes everyone either younger or elder. When, there is a balance of green color in a human body, the person is kind and generous to others. Has sympathy for everyone. Shows mercy on others, understand emotions, and create harmony with all. The person has the ability to adapt himself as per the circumstance. He is social and loves children, nature, animals, that is, everyone. The negative aspects shown by a person having unbalanced amount of green color are as follows:- The person shows dishonesty in matters regarding money. Tries to keep himself far from others, that is, he will not socialize with everyone. He will show jealousy. Individual may have tendency of getting greedy. May start rushing after money and property. The person may lack attention. Some disorders are generated in a person if green color get unbalanced. He may have heart related problems. Diseases related to immune system can occur. Allergies can be caused. Has chances of breast cancer. Green color is a balanced color. This color is located in the middle of visible spectrum. The three colors before green color are called ‘cool’ color and provide peace to an individual. After green color, the other three are called warm colors and they have great stimulating effect. Since, this color is situated at the center, it has an effect of both warm and cold. This color maintains a balance between the two. Whenever color therapy is used on a patient, then at the end of the therapy green color is a must for use. It is a balanced color and is useful in removing stress. If a person has faced some shock then wrapping green silk on his shoulder has a very good therapeutic effect on patient.